I have never been a fan of graphic novels, but recently I read and enjoyed Guy Delisle’s Pyongyang: A Journey in North Korea . Guy Delisle worked in Pyongyang as a project manager for a French animation company in the early 2000’s. The outsourced animation projects he oversaw seemed to run themselves, and finding himself without much to do, Guy busied himself by sketching scenes of Pyongyang and documenting instances of culture shock he encountered. Pyongyang: A Journey in North Korea is witty, and fair (I believe) to what the experience must have been like as an expat there in the early 2000’s. His portrayal of Pyongyang’s unique buildings and architecture is spot on, and I found myself reminiscing over the many little details of Pyongyang he sketched: 50’s era Hungarian buses with star embalms, each star indicating 5,000 accident free driving miles, ladies of Pyongyang wearing socks hiked up over their nylons, and fly swatting waitresses. Even the lonely (and endangered – so I’m told) turtle in the giant fish tank at the Yanggakdo Hotel bar is a recurring character. For North Korea watchers not fortunate to have visited the country, perhaps the most useful sketches from Pyongyang: A Journey in North Korea are of Guy’s visit to the International Friendship Exhibition, a site where interior photography is prohibited. It’s a shame Guy never visited the Kumsusan Memorial Palace and Mausoleum; his sketches would have been quite valuable as interior photography is also prohibited there. For fans of graphic novels, and for those waiting to properly fill out their North Korean book collection, I certainly suggest picking up Guy Delisle’s Pyongyang: A Journey in North Korea . The documentary A State of Mind broke ground in 2003 as the first western production to be allowed unrestricted access into Pyongyang, filming in the homes of friends Pak Hyon Sun (age 13) and Kim Song Yun (age 11), and showing insights into their daily life as they trained for gymnastics performances in a run of mass games. Their determined preparation leading to the film’s “socialist realist extravaganza” mass games finale is fascinating, but I more enjoyed the peeks into the girl’s daily lives: attempts to ditch homework, delight as one girl inherits a room when an older sister joins the army, and a father complaining about his house full of chatty woman. The filmmakers successfully present a non judgmental viewpoint, but there is no mistaking the reality of a people’s collectivist mindset. Sacrifice of individuality to the needs of the state is the film’s major theme – which is precisely what the mass game and other mass events aim to be the ultimate representation of. Filmed a decade ago, this is not the DPRK I am firsthand familiar with, but I still love this documentary and consider it required viewing for anyone with an interest in the country. I personally know the director, and although I haven’t met the girls from the film, I have seen behind the scenes photos of them from the production, making this extra special film for me. You can find A State of Mind on Amazon.com. I work as a Chief Mate on U.S.-flagged oceanographic research ships. The voyages and expeditions I have worked brought me from the Yangtze River of China, to the icebergs off Cape Horn South America, Antarctica, and many other points around the world. My passion is world travel and I have spent the last 13 years working and independently traveling through over 90 countries. I have no home and live out of a backpack. I also love to read literature, study history, and make trouble where and when I can. Traveling to North Korea has been a life changing experience but it's far from being my only one. I have hiked at Mt. Everest, worked as a white water rafting guide, hung out with rebels and liberation armies in various war zones, been killed off in a Chinese kung-fu film, studied Vietnamese at a university in Hanoi, and most recently I received the US Coast Guard's highest license, Master Unlimited. In 2013 I became a partner and guide with Young Pioneer Tours. I spend my 5 months of vacation a year working the cutting edge of experimental travel, not only in North Korea, but in Iran, Eastern Europe, and remote parts of Asia - places your parents wished you stayed away from! For all regular scheduled trips by Young Pioneer Tours a mention of this blog can get you 5% off! Through doing tons of research I came upon a blog by Joseph Ferris called "American in North Korea". I followed it for about a year and one day he posted he would be doing private tours with Young Pioneer Tours out of Beijing. I quickly responded with my interest in going along and contacted YPT. Not only are they less expensive than the other tour companies, but they get more access and I feel like they have much better relations within the country. We were there for 8 days and saw the typical sites with a few surprises along the way. The incredible Ms. Yu and Mr. Lee were our guides. 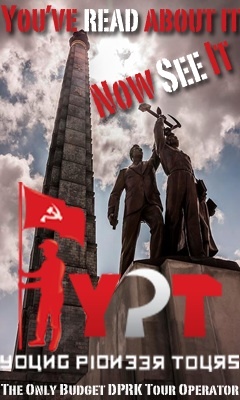 I would highly recommend YPT to anyone thinking of not only going to North Korea, but they have a lot of other amazing tours to some amazing places that you won't find anywhere else. Their customer service is excellent. Any questions are always answered promptly. I'm looking forward to many more trips with this company! I spent three months all over Asia with YPT, specifically their new guide Joseph Ferris. Their team is helpful, dedicated, thoughtful, considerate, supportive and most of all FUN! They're LOTS of fun! Their prices are better than the competition and you get so much more bang for your buck. They're always working, someone is always available, and they always put the customer first. I know for a fact that many of the owners and guides sacrifice a lot to give the customers a little more. I've spend 15 years traveling the world and I say without hesitation or reservation that you won't get a better deal or have a better experience with any other agency! Check out the first podcast ever recorded inside North Korea. Then hear our reflections upon returning to the States. Check out my newly released 2012 Kim Il-sung 100th birthday podcast and 2013 podcast. All photos are original work by Joseph A Ferris unless credited otherwise.